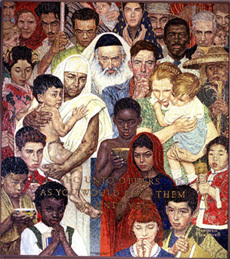 The mosaic The Golden Rule by Norman Rockwell depicts people of different nationalities standing together with the inscribed words "Do unto others as you would have them do unto you". The UN General Assembly has proclaimed 2010 the International Year for the Rapprochement of Cultures and has designated UNESCO to play a leading role in the celebration of the Year - capitalizing on the Organization’s invaluable experience of over 60 years to advance “the mutual knowledge and understanding of peoples”. In line with UNESCO’s mandate, this International Year is both the culmination of the International Decade for a Culture of Peace and Non-Violence for the Children of the World (2001–2010) - and the starting point of a new strategy. In a shifting international context, UNESCO gives increased importance to this theme which is at the forefront of the objectives of its Medium-Term Strategy for 2008–2013: “The fostering of cultural diversity and of its corollary, dialogue, thus constitutes one of the most pressing contemporary issues and is central to the Organization’s comparative advantage”, that is, recognizing the great diversity of the world’s cultures and the links uniting them.